Brass is actually a mixture of Copper and Zinc and is one of the most commonly used metals in the world. We stock Brass in two forms: sheets and bars. c260 Brass Sheets is yellow in appearance and is commonly used for shell casing. That's why most people call this alloy "Yellow Brass" or "Cartridge Brass". It has great formability and workability. 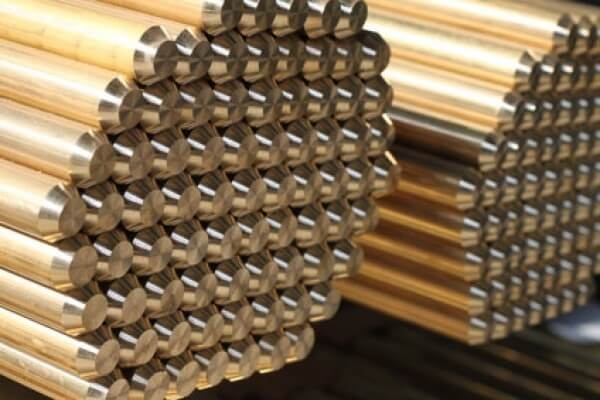 c360 Brass bars is the most common of all the brass alloys and is typically found in the form of rounds, flats, squares, rectangles, and hexagons. It's highly machinable and perhaps that's why most people refer to it as "Free Machining Brass". 260 Brass is one of the most commonly used brass alloys. It’s also called yellow brass and cartridge brass because it’s used for shell casings. Normally, this brass alloy is only available in sheet form. Generally, 260 brass sheets are formable, workable, and easy to solder. 360 Brass bar is also a very commonly used brass alloy. This 360 brass usually comes in bars and rods. It’s also called “free machining” brass because it can be easily cut and machined to size because of a small percentage of lead (2%-5%) within it. Unlike steel, 360 brass bar stock will not spark when struck. This makes it useful in applications where sparking can be dangerous (i.e., near flammable and/or combustible materials). Request a quote for the brass bar stock, brass sheet, and other brass products you need, or contact M&K Metal Co. to learn more.